Part of the Midwestern region and the Upper Great Plains of the United States, North Dakota borders the country of Canada. The major tribes in North Dakota have been Mandan, Hidatsa, Arikara, Chippeaw and Sioux. A French-Canadian, La Vérendrye, visited the Mandan tribes around 1738 and was astounded by their level of development. Yet, the region had little development until the 1800s and just a little amount of trade with the Indians. North Dakota became a territory of the United States in 1861. 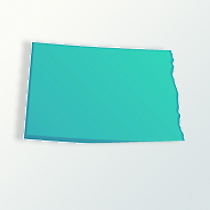 In 1889, it was made a state. To help attract new immigrants, state sent pamphlets and newspaper accounts celebrating the “Myth of North Dakota.” A statement that the land was a garden that everyone could own their own home and that the land was to be settled by good people. There was some growth, with 190,900 people in 1890. It would be around 1910 before large waves of settlers would come to North Dakota. Then, the population reached 577,000. Many of German descent from other states emigrated there, as well as people from Iceland, Sweden, Norway and Denmark. An interesting note in North Dakota genealogy is the large group who emigrated from the New England states and helped establish new towns. A massive number of German-Russians, about 100,000 immigrated around 1900, settling primarily in North and South Dakota, Kansas and Nebraska. The south-central part of North Dakota became known as “the German-Russian triangle.” They settled in close-knit communities keeping their German language and culture. In North Dakota, farms have increased in acreage and decreased in overall numbers. There is the oil and coal mining industry which has grown over the years, with their very high pay, making it attractive to people to move to North Dakota. In 2009, the population was about 646,800 residents. In the state of North Dakota, the largest ethnic group are those of German descent, about 47 percent of the population. A strong element in North Dakota genealogy are the Norwegians who make up 30 percent of the population in the state. The Irish represent 8 percent. The Native Indian population is 5.3 percent of the total state population. The state is known for having the largest powwows held in the United States. The traditional ceremony marks the season of spring and rejoice on the beginning of new life. The African-American numbers are very small, only .9 percent. The Hispanic community is about 1.8 percent in North Dakota.